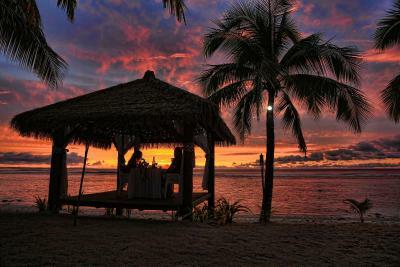 Lock in a great price for Crown Beach Resort & Spa - rated 8.5 by recent guests. Staff were absolutely amazing. Our room with private pool was great. Breakfast buffet was the best of 3 resorts we stayed at. 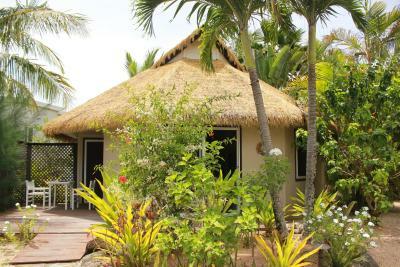 Wonderful ethnic thatched ‘apartment ‘ and having private pool was a treat. - The staff - very friendly and attentive to our needs. Our flight arrived very early in the morning and they gave us breakfast while we waited for our rooms to be ready. - The restaurant entertainment - we had a couple of great solo singers playing during our dinners on Saturday and Sunday night. - The convenience - right next to the airport and the main town. - The sunsets - this place has one of the best seats in the house when it comes to seeing spectacular sunsets. 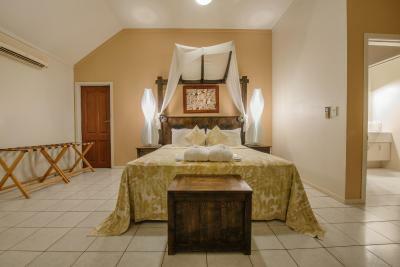 - The rooms - although the decor looks a bit old-fashioned, the villas are very comfortable, quiet and very spacious. - The breakfasts - a good mix of hot and cold foods in the buffet means there's something for everyone. The rooms were so lovely, clean, private and comfortable. The bathroom was amazing and spacious with a beautiful big classic bath and large monsoon shower. The breakfast was great, even with a make your own waffle station. And their second restaurant Flambé had the most delicious food of our whole trip! It was an expensive meal but well worth it. All of the staff were very friendly. The whole resort is lovely. Really liked the private pool. The breakfast was delicious. Very quiet. Didn't take part but the cultural night looked great fun. The beach area was amazing and we saw whales several times! Free use of kayaks and snorkel gear was a big bonus and a great thing to do. Staff were really happy and friendly. The service was very good and the staffs very friendly. The seafood buffet on Tuesday night was excellent. 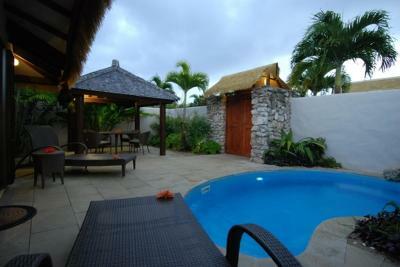 The private pool and villas was a real sanctuary for rest and relaxation. Set on 5 acres of lovely gardens, the adults-only Crown Resort & Spa, offers luxurious suites and villas with balconies in tranquil surroundings with access to the beach. 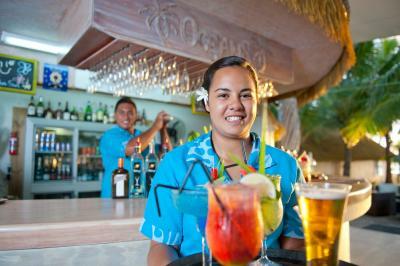 It features 2 restaurants, a scuba dive centre, fitness centre and outdoor swimming pool. Some of the many leisure activities available nearby include canoeing, diving and snorkeling. The spa at Crown Beach offers a range of relaxing treatments including massages, facials and manicures. 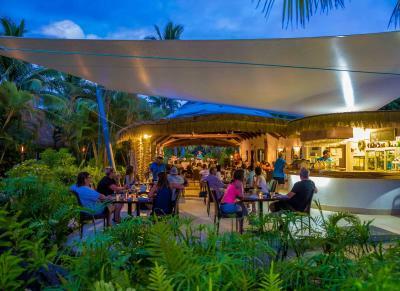 Rarotonga Airport is a 7-minute drive away from the hotel. 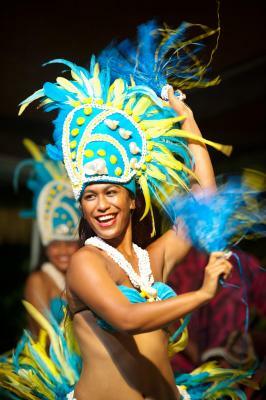 Avarua town centre is 10 minutes' drive away. There is a golf course less than 1.2 miles from the hotel. The Oceans Restaurant & Bar offers Brasserie-style cuisine, with themed nights and a cocktail menu, on the beach with panoramic ocean views. 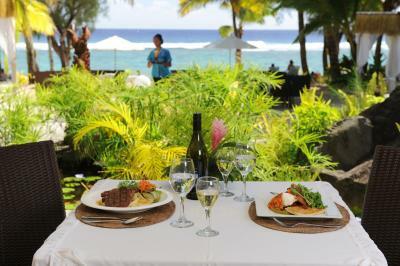 Guests can enjoy modern cuisine in an elegant setting at The Windjammer Restaurant. All of the accommodation at this resort is air-conditioned and has a TV. 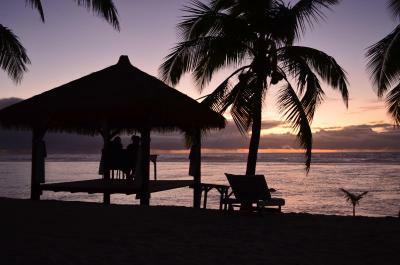 Arorangi is a great choice for travellers interested in sunsets, sunshine and friendly locals. 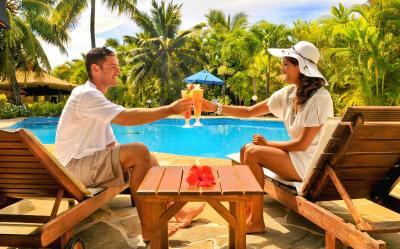 Crown Beach Resort & Spa has been welcoming Booking.com guests since 29 Jun 2010. 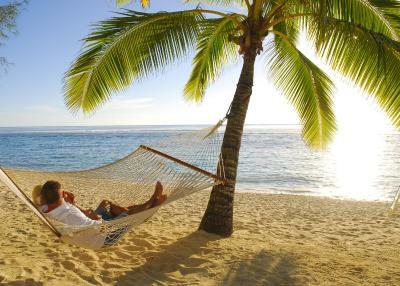 When would you like to stay at Crown Beach Resort & Spa? This air-conditioned villa features large outdoor balcony with garden and beach access, a fully equipped kitchen and a living room with flat-screen TV, DVD and CD player. There is a separate bathroom with shower and toilet. 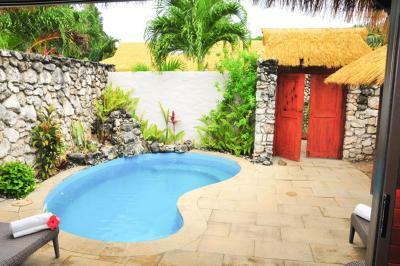 This air-conditioned villa features large outdoor balcony with pool, garden and beach access. 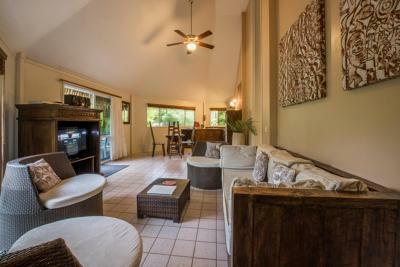 Includes a fully equipped kitchen and a living room with flat-screen TV, DVD and CD player. There is a separate bathroom with twin showers, twin vanities and a toilet. This luxurious ultra private suite features high stone walls, a private swimming pool and an outdoor dining gazebo. The lounge includes a flat-screen TV, DVD and CD player. The kitchenette has a microwave. There is an en suite bathroom with a separate toilet, clawfoot bath tub, twin vanities and monsoon shower. 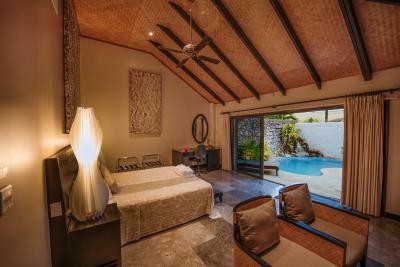 This villa boasts a large deck with outdoor furniture and direct access to the beach and turquoise lagoon. 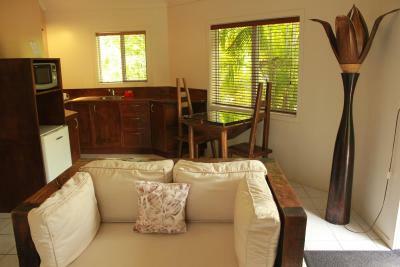 There is a 2-post king bedroom, a large fully equipped kitchen and lounge room with flat-screen TV, DVD and CD player. The spacious bathroom includes a shower, vanity and toilet. 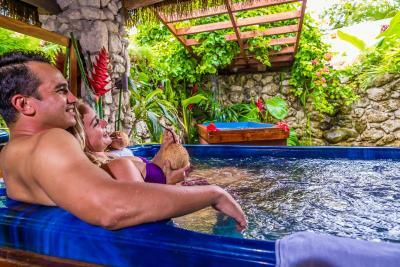 House rules Crown Beach Resort & Spa takes special requests - add in the next step! 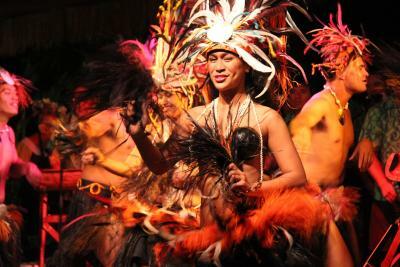 All further adults are charged NZD 80 per night for extra beds. Crown Beach Resort &amp; Spa accepts these cards and reserves the right to temporarily hold an amount prior to arrival. Crown Beach Resort & Spa accepts these cards and reserves the right to temporarily hold an amount prior to arrival. Very enjoyable stay in a Pool Villa. Nice to have some space and own private pool, although the resort pool wasn't busy the few times we went. Only ate dinner once in Ocean's restaurant, beautiful meal and really enjoyed it. Breakfast buffet was each day was nice with fresh cooked eggs and a selection of hot items + waffles. I didnt like being charged a rate which was much higher than if I had gone through a different accommodation provider. I really felt ripped off and this affected my stay. The price of the room per night was too high for what I got and I could have done a lot better at a different resort. The rooms were very dated. 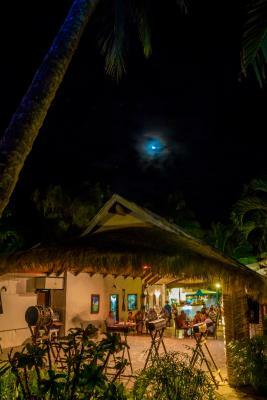 It is right on the beach and the food in the restaurant is amazing! - The beach - this one is a bit rocky and not great for swimming. 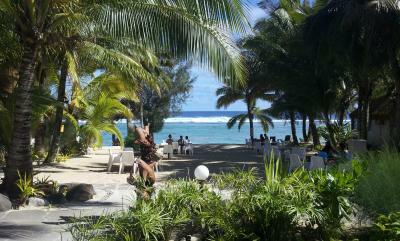 That said, there are pros and cons with every location in Rarotonga, so you can't be too picky. We had poor weather which certainly didn't help the enjoyment factor, but that's not the fault of the Resort. Food was average to poor, while what activities we saw were mostly at or past there used-by date. There wasn't a lot to like. Most matters are mentioned or covered under dislikes. Our room was nice and up-to-standard, but that was very expensive.